Jimi Hendrix was one of the most original electric guitarists of all time, combining blues, hard rock, modern jazz, and soul into his own unmistakable sound. He was also a gifted songwriter. Jimi Hendrix was born Johnny Allen Hendrix in Seattle, Washington, on November 27, 1942, the son of Al Hendrix and Lucille Jeter. His father—a gifted jazz dancer who worked at a number of jobs, including landscape gardening—bore much of the responsibility of raising the boy and his brother, Leon, as did their grandmother and various family friends. This was due to the unreliability of Lucille, who drank excessively and who would disappear for extended periods. Al Hendrix changed his son's name to James Marshall Hendrix in 1946. Al and Lucille divorced in 1951; Al Hendrix won custody of his sons and exercised as much discipline as he could, but the boys—young Jimi especially—worshipped their absentee mother. Jimi Hendrix wanted a guitar early on. Before acquiring his first real instrument, he "played" guitar on a broom and on a one-stringed ukulele. At last Al got his son a guitar, and the twelve-year-old Jimi began to teach himself to play. Jimi restrung the guitar upside down—as a left-hander, he was forced to turn the instrument in the opposite direction from how it is usually played, which left the strings at the bottom unless he rearranged them. He learned blues songs from records by greats like B. B. King (1925–) and Muddy Waters (1915–1983). The guitar rarely left Jimi's side, even as he slept. By his mid-teens, Hendrix had formed a band called the Rocking Kings. He played behind his back, between his legs, and over his head—as had many blues guitarists before him. Thus he became a favorite to audiences, if not to all musicians. After dropping out of Garfield High School in Seattle, Hendrix joined the army at age seventeen to avoid a jail sentence for riding in a stolen car. He volunteered as a para-trooper (a person who jumps from planes using a parachute) and was soon jumping out of airplanes. Eventually he sent for his guitar and continued playing whenever he could. He met another soldier, bass player Billy Cox, with whom he formed a band that entertained troops all over the region. After leaving the army, the two friends formed the King Kasuals and began playing regularly at a club in Nashville, Tennessee. Hendrix became known as the hottest guitarist in town. At the time he lacked confidence in his singing and was content to back other artists. Over the next few years Hendrix toured with several different bands, often stealing attention away from bandleaders who expected him to stay in the background. Hendrix's looks and on-stage behavior were influenced by the early rocker Little Richard (1932–). Hendrix played with the Isley Brothers, with saxophonist King Curtis, and later with friend Curtis Knight. In 1965 he signed a contract with Knight's manager, Ed Chalpin, receiving an advance of one dollar. He then formed his own group, Jimmy James & the Blue Flames, and moved to New York. In September 1966 Hendrix was brought to London, England, by Chas Chandler, a member of the rock group the Animals who wanted to be a manager. Chandler suggested changing the spelling of Hendrix's first name to Jimi and helped him form the Jimi Hendrix Experience with bass player Noel Redding and drummer John "Mitch" Mitchell. Recording began the following month. By December the Experience had released its first hit single, "Hey Joe." Hendrix amazed even London's biggest rock stars with his electrifying stage show. He once said, "I sacrifice part of my soul every time I play." The Experience's first album, Are You Experienced?, was a huge success. Back in the United States, crowds were stunned by Hendrix's performances, which included the burning of his guitar. 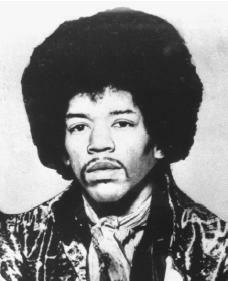 The band's next album, Axis: Bold as Love, showed Hendrix's growth as a songwriter, but he was unhappy with the way it sounded. He was also becoming tired of audiences who expected a "wild man" act. Hendrix tried to expand his musical range on Electric Ladyland, an album he had complete control over, and that was the greatest achievement of his brief recording career. At this point Ed Chalpin sued Hendrix over his contract with the guitarist, causing problems for several years. Hendrix's managers decided to build Electric Ladyland Studios, hoping to save money on recording costs. To help pay for the studio, Hendrix was forced into endless touring, which caused the Experience to break up. Hendrix then formed Band of Gypsys with his old friend Cox and drummer Buddy Miles. In 1969 Hendrix's famous performance of the "Star-Spangled Banner" at the Woodstock festival in New York captured the anguish of the Vietnam War era (1957–75; a war in which the United States aided South Vietnam in their ultimately unsuccessful efforts to stop a takeover by Communist North Vietnam). Band of Gypsys recorded only a live album before drummer Miles left. Mitchell returned, and Hendrix began recording tracks for a new album, to be titled First Rays of the New Rising Sun. Before it was finished, Hendrix died of an overdose of sleeping pills on September 18, 1970. Jimi Hendrix was elected to the Rock and Roll Hall of Fame in 1992. The following year he received the Grammy Awards Lifetime Achievement Award. Many rock, rap, and blues artists contributed versions of his songs to the 1993 tribute album Stone Free. In 1999 Al Hendrix published My Son Jimi, a biography of his son's family life. Black, Johnny. Jimi Hendrix: The Ultimate Experience. New York: Thunder's Mouth Press, 1999. Hendrix, James A. My Son Jimi. Edited by Jas Obrecht. Seattle: A1Jas Enterprises, 1999. Shapiro, Harry, and Caesar Glebbeek. Jimi Hendrix: Electric Gypsy. New York: St. Martin's, 1991. I think Jimi is awesome. It is to bad he did all those drugs though. When you read that Jimi died from a barbituate overdose, what they fail to tell you is that Jimi's white girlfriend, gave Jimi a higher dose of sleeping pills than he would normally take...she woke up the next morning, but he didn't. Personally, I don't think it was just an accidental overdose...I think he was killed.